Knowing it all and still being able to see your blind spots are two completely different things. It’s important to maintain a curiosity about your craft while still being close enough to create new cues and tips. Jeff Baldwin is the master of being both the professor and the coach. In this episode, Jared and Alex sit down with Jeff Baldwin, a coach, martial artist, a military man, swimmer, dog lover, motorcyclist, business owner, husband, and rebel against any ONE way. Jeff is the owner and head instructor at Rebellion Martial Arts Academy, which teaches Jeet Kune Do, Muay Thai, Brazilian Jiu-Jitsu, Judo, and the Filipino Martial Arts of Eskrima/Escrima, Arnis, and Kali. He has over 30 years of martial arts training with black belts in Brazilian Jiu-Jitsu, Judo, and Kempo Karate, and possesses instructor certifications in Bruce Lee’s Jeet Kune Do and Filipino Martial Arts. Jeff also spent 6 years serving in our country’s military in various Ranger, Airborne, and Light Infantry Units. Wisdom is getting answers to questions you’ve never had. If you’ve ever wondered how to help clients when you know you don’t have the skills to solve their issues – Dr. Licata has some ideas to help. We sat down and chatted with Dr. Giancarlo Licata, a Pasadena based Head & Neck Chiropractor, Co-creator of the Pasadena Integrative Community of Health Professionals, Interdisciplinary Concussion specialist, multi-linguist, graduate of UCSD with a B.A. in Political Science and a minor in Spanish literature, former guest on The Ricki Lake Show, husband, and father of three. Dr. Licata is one of only 220 doctors in the United States trained in NUCCA (National Upper Cervical Chiropractic Association). He is board certified by the National Board and California Board of Chiropractic Examiners and works with individuals with complex challenges to their head and neck. He is also the clinic director at Vital Head & Spinal Care in Pasadena, California. What sets an outstanding coach from just a coach? Is it their ability to teach beyond just the technical skills? On this episode, we sit down with Steph Gaudreau of Stupid Easy Paleo and discuss how to become a masterful coach and teacher. Steph is a coach, former high school biology teacher, weightlifter, chef, author, mountain biker, soccer player, CrossFitter, podcaster, blogger, photographer, nutritionist, wife, cat lover, Twitter romancer, and Lord of the Rings fan. Steph is the creator of the critically acclaimed, widely popular, and OG paleo website Stupid Easy Paleo. Her podcast, Harder to Kill Radio – Forging Unbreakable Humans, brings together the best experts in fitness, nutrition, sleep, and mindset about how to build unbreakable humans. She is the published author of The Paleo Athlete: A Beginner’s Guide to Real Food for Performance, and The Performance Paleo Cookbook: Recipes for Training Harder, Getting Stronger and Gaining the Competitive Edge. Additionally, you can find her coaching Weightlifting at CrossFit Fortius in San Diego, CA. How much changes with you and your perspective after becoming a studio owner? We dig into this concept with former guest (and dear friend of the show), Isabelle Barter, who recently opened Stronger Human in Phoenix, Arizona. Isabelle is a coach and movement educator that has an insatiable appetite for continuing education. She is the founder of Stronger Human and Movement is My Medicine, a 200-hr experienced registered yoga teacher, Yoga Tune Up® teacher, Strong First Kettlebell Level 1, Z-Health, Functional Range Conditioning, and the Functional Movement Screen. What does it mean to fully embody and live your why on a daily basis? 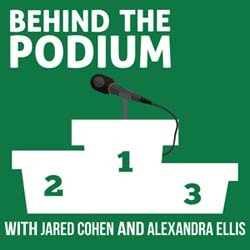 We go behind the podium with Laura Ahrens, a coach, yoga teacher, yoga teacher-trainer, published-audible movement narrator, singer, piano player, harmonium player, graduate of The University of Arts with a bachelor of fine arts, Harry Potter fan, co-owner of a fashion company, recipient of a signature menu item named after her at Whole Heart Provisions in Boston, and an aspiring superhero with the power to re-align parked cars to make more space. Laura holds a 200-hour certification in Hatha Vinyasa, a 200-hour plus advanced certifications in Forrest Yoga, and completed a year-long mentorship under the guidance of Dr. Heidi Sormaz and is currently in her 500-hour yoga therapy training with Sarahjoy Marsh at the DAYA Foundation. Moreover, she co-created The New School of Yogic Arts—a teacher training school for those who want to learn to teach the practice of yoga as a living system that breathes differently in each body. Laura can be found teaching vinyasa and core flow classes at Coolidge Corner Yoga in Brookline, MA and at Sadhana Yoga in Boston, MA.